New recipes are few and far between right now, we’re just enjoying old favourites. As we move from what was really not a bad British summer into a typical autumn (hot and sunny one day, grey and drizzly the next) we’re enjoying lots of walks around Bexhill. Time to share some of the walks we enjoy. First of all, the beach at Bexhill. We live just a few minutes walk from the main “prom” or promenade. During certain times of the year, dogs have to be kept on lead so we head off westwards to and area called South Cliff where they can run off lead. It’s always full of dog walkers and at weekends families with young children, cyclists, older folk and everyone in between who enjoy this car free paved walk. If you keep walking, you reach a little local landmark, a sculpture made from driftwood by a local artist of “Salty Sam and Seawater Sally”. Sadly, it has been vandalised in the past, but now people seem to like to stop and leave pebbles with messages written on them. It’s always changing, a living sculpture. If we head Eastwards, we go towards and gentle slope and grassy area by the beach called Galley Hill. We can enjoy views in one direction towards Eastbourne and Beachy Head and in the other direction Hastings. A Peace Pole was erected near the top of the hill earlier this year and links Bexhill-on-Sea with every other place on earth that has participated in the project. If we keep walking east, we can follow a coastal path all the way to Hastings, but the dogs are always more interested in exploring than covering great distances! When the wind is howling, or it’s a hot, hot day, it’s fun to head off into the woods. Within driving distance we have large areas of woodlands, but just on the edge of town we have Collington Woods, a small woodland area, beautifully preserved and maintained. Great for sheltering from the wind or heat. Normally a quiet month, a little flat after the excesses of Christmas. Not so here, it seems to have been busy and bright….and I’m not complaining. We have been pretty good about eating lighter, and eating less meat, but I have turned to an old standby favourite this month. Tray baked chicken (although I used an oven dish!). It’s a quick dish to throw together using whatever is nestled in the fridge and although I mostly use skinned, bone-in chicken joints, it’s great with fish fillets or just veggies. Peel and chop potatoes into large pieces, add vegetables like peppers, courgettes, tomatoes, carrots and a full head of garlic. I haven’t given quantities as this dish is great for one, two or a dozen people. Just judge how much your crowd will eat, add a little extra as they will always want to go back for more, and find an oven dish or tray to fit the quantity. Put all the ingredients into the dish, preheat the oven to about 180 degrees. Pour over some olive oil, season with coarse sea salt and freshly ground pepper then customise any other seasoning to whatever takes your fancy. This time I used some dried oregano from our garden in Spain, a little smoked pimentón and half a finely chopped lemon. Mix together well, hands work best for this to ensure everything is well coated, and add a good slug of white wine, stock or water. Cover tightly with foil bake for about an hour then remove the foil and bake for about 20 minutes more until everything is starting to brown nicely. If you want to add some tender vegetables (I used some chopped kale) stir into the dish about 10 minutes before you’re finished. Then it’s straight to the table, perfect one pot cooking! We’ve been enjoying the winter sunshine and taking walks along Bexhill beach. Then a quick trip across the channel to stock up on wine (stocks were dangerously low) and a lovely night in Le Touqet were enjoyed last weekend. And little Alfi, one of our pups, has started on a course of hydrotherapy to build up his leg muscles after an operation on his hind leg in November to repair a damaged cruciate ligament. He’s not a water loving dog so is highly unimpressed with being put into a warm pool then shampooed and blow dried afterwards. I’d be delighted at the opportunity of such pampering but there’s just no pleasing some pups….! I’ve been cooking and have some recipes to share with you soon, but in the meantime, enjoy the last few days of the month. If, like me, you don’t fear the carbs (although realy I should), this is a tasty and economical pizza to feed a crowd. And then you take the crowd out for a walk to burn off the carbs! Roll out your dough to fit the tin and place it on some greaseproof or baking paper. Cover with the tomato sauce. Mix the potato, cheeses, spring onion and garlic together in a bowl and spread this mixture over the pizza. Lay the anchovies over the top and pour over any oil from the tin. Slide the pizza onto the hot tray (with or without the baking paper) and bake for about 12-15 minutes until the cheese starts to brown and the pizza is crispy. Hope you enjoy the walk, click on the photos to see them in more detail. Well, I didn’t man to knock down a wall, I was actually stripping wallpaper off it. And a very tricky, sticky job it was too. Then a little crack appeared, so I tapped it and a little hole appeared. So I tapped it. And before I knew it, I really shouldn’t have bothered spending all that time carefull stripping the paper off, as the wall fell down. Well, strictly speaking it fell off, but either way…it’s another job for Big Man. At least the pups weren’t bothered by the dust and noise, they just made themselves a little nest of warm sticky wallpaper and bedded down for a snooze. Then it was time for a walk and a stunning sunset. The waves blew the cobwebs (and house dust) away. And there was even time to admire the architecture of The Colonnade, a beautiful listed building dating back to 1911. Recipes are thin on the ground this week, we’re eating old favourites but when the dust settles, I’ll be back with the food. Now…where’s that corkscrew?! Ok, so if you don´t live in Europe and/or you are not a football fan you are probably not desperately interested in Euro 2012, the European Football Tournament that reached the first of the semi final stages tonight. But, indulge me, and feel my pain. Spain won tonight (on penalties, which is not really a proper win in my book, but there you go) and are through to the final. Yes, “we´re” through to the final!!! And in celebration, Alfi wholeheartedly joined in the celebrations. See that look of joy on his face? Ok, it´s submission knowing that he´ll get a biscuit. The pain comes from the Italy-Germany match tomorrow night. I have a Spanish Big Man and an Italian Father and Passport. What happens if/when Italy win and it´s an Italy Spain final on Sunday? Feel my pain and tell me…do I wear my Spain shirt or my Italy shirt?! I have mentioned previously that we have some mushrooms growing, intentionally I might add, in our garage. It was a slow start, but we are now getting regular supplies of oyster mushrooms to enjoy. After a week away, they had gone a little crazy, and some of the ordinary mushrooms which we are also growing had turned into monsters which I´ll chop up and use in sauces or soups. Back from London with not much in the fridge, we had to “make do and mend”, as my grandmother used to say. The fire was blazing merrily, so we put some of the larger mushrooms onto our parilla (which is a grill which you can sandwich things between) and cooked them over the embers of the fire. You could do this over a barbecue or even under the grill (for grilling I´d recommend you brush them lightly with oil first). Once they were done we seasoned them with Maldon sea salt, freshly ground pepper then drizzled some olive oil over and added a little squeeze of lemon juice. With a softly poached egg and a plate of jamon we enjoyed a simple supper but felt that we had dined like Kings! PS. Our dogs Luna and Alfi stayed with our lovely neighbours while we were away. Our dogs love being there and they get loads of walks. It seems this week they discovered the joys of goat manure and spent lots of time playing in it, which was much less fun for our neighbours who had to deal with two very stinky dogs. Alfi is now in need of a major haircut and they were both happily exhausted yesterday when we got them home. I took this snap of them “recovering” from their week of fun whilst trying not to laugh too much at Alfi´s lack of energy to get either into or out of the bed. No food today (well, I will be eating some of course! ), so click away now if you´re not interested in crochet, knitting or sewing. Winter means cooler weather and I can get out my scraps of wool, find out who is expecting a baby (there are usually quite a few in the family who are “in the family way”) and get knitting and crocheting. We have a niece expecting twins and one of my best pals Donna is about to become a great aunt. Sshh, I´m not allowed to call her that! Lots of the men in my life got a beanie for Christmas…thanks to Mandy at The Complete Cookbook for the instructions. Then lined it with some pretty fabric I had, which will also make it stronger and less liable to stretch too much. I made a pinny for Donna (she´s a lucky girl) who moves house next week from London to Lewes. I thought she could run around with a feather duster looking like a 1950´s housewife in this. Recognise the fabric?! And of course, the enormous orange blanket which the dogs, Luna and Alfi, are On No Account Allowed To Lie On! We´re very lucky Up The Mountain to be able to get hold of fresh fish, even though we live 45km from the coast. 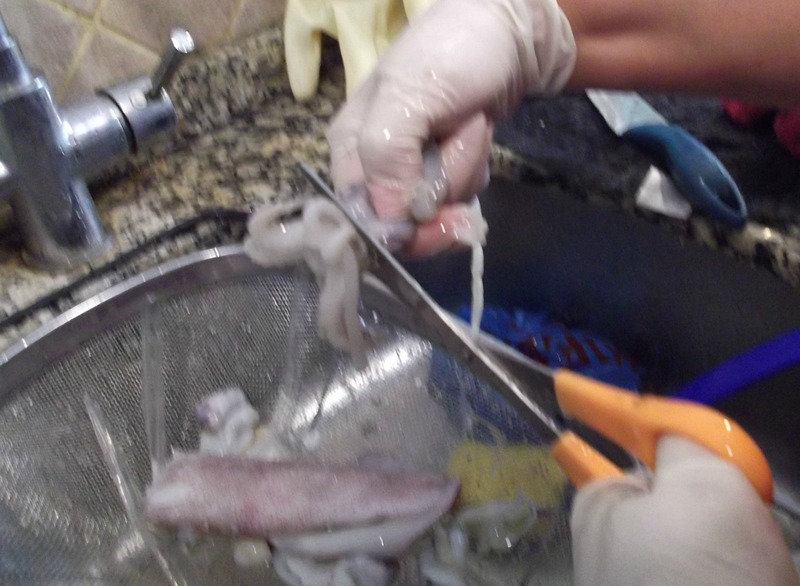 Having said that, I do keep fish in my freezer and cleaned squid is one of those things that keeps well and seems to suffer no ill effects from freezing. We don´t get a visit from Fish Man on Mondays, becuase there is no fishing on Sundays, but this morning he drove up, and this is what we bought. One of the effects of little Alfi´s run in (literally) with Fish Man´s van is that when he hears him approaching and bipping his horn, he runs and hides under the nearest table, shaking and looking very sorry for himself. Whilst I don´t like to see him frightened, at least I know he has learned a very important lesson as far as cars and dogs go. 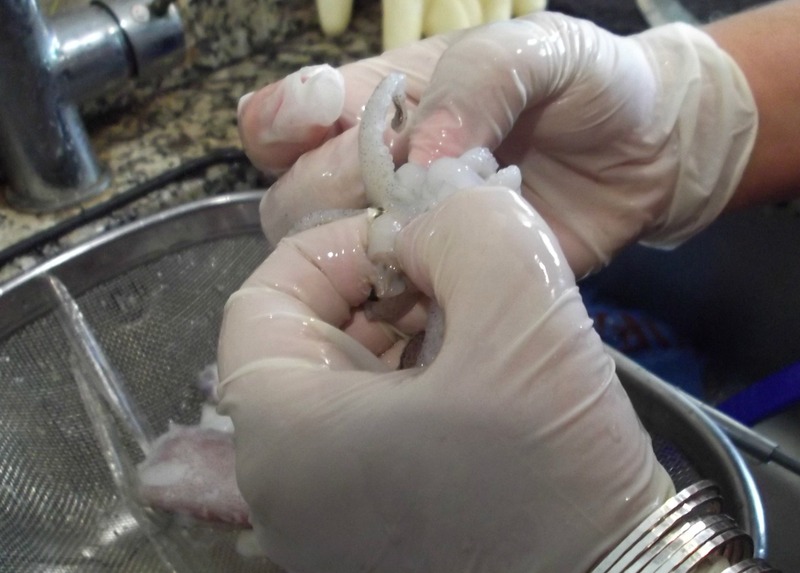 Today I´m going to give you a super easy way of cooking squid, which I know can be quite scary looking. 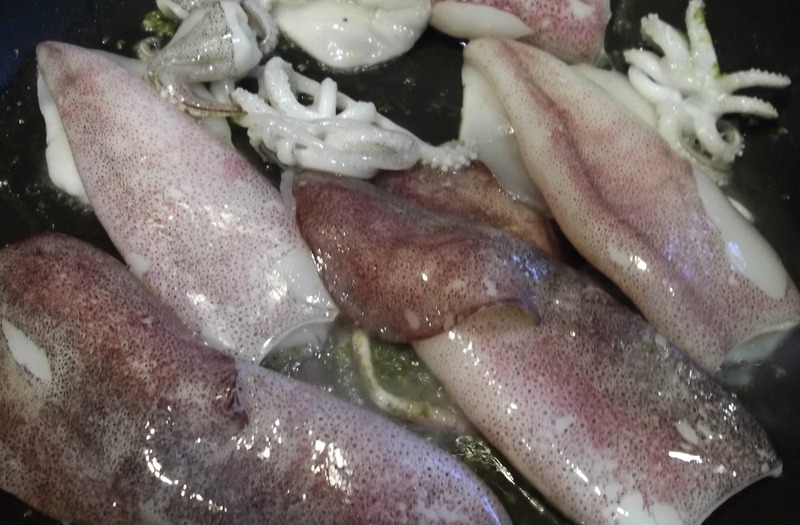 I´m also going to tell you how to clean them if you ever do get lucky enough to get hold of fresh squid for either cooking that day or freezing for another day. Feeling brave? Come on then, get those kitchen gloves on and let´s get cracking. 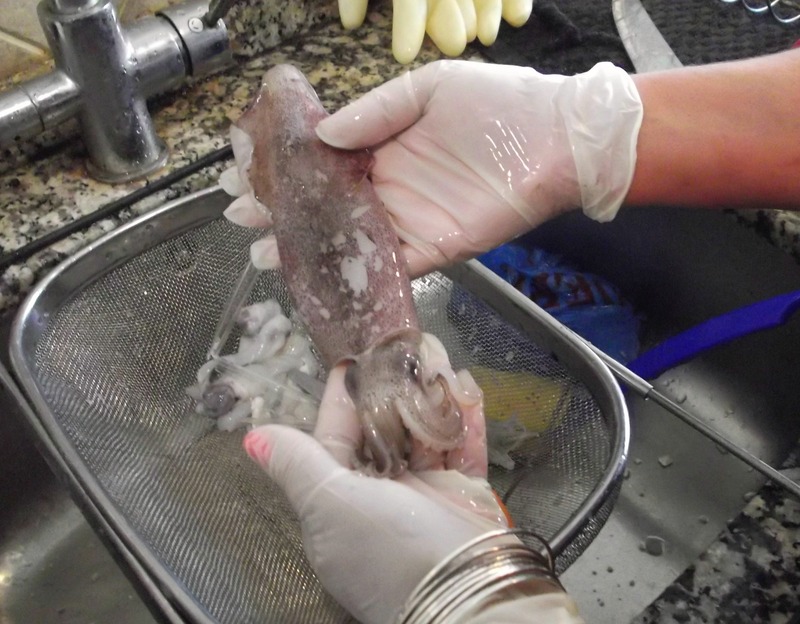 First of all you need to grab hold of that squid like you mean business. Now pull the legs and anything that comes with them out and put to one side for the moment. Now pull out the spine which looks like a sliver of clear plastic. Sorry this is a bit blurred – Big Man was in charge of photos and was excited about eating squid! Rinse the body (including the inside) and go back to the legs which you will pull or snip away from any mucky bits in the middle just below the “eyes”. Still blurry, still excited! From the centre of the legs (which are really tentacles!) pull out the hard centre core (or beak). 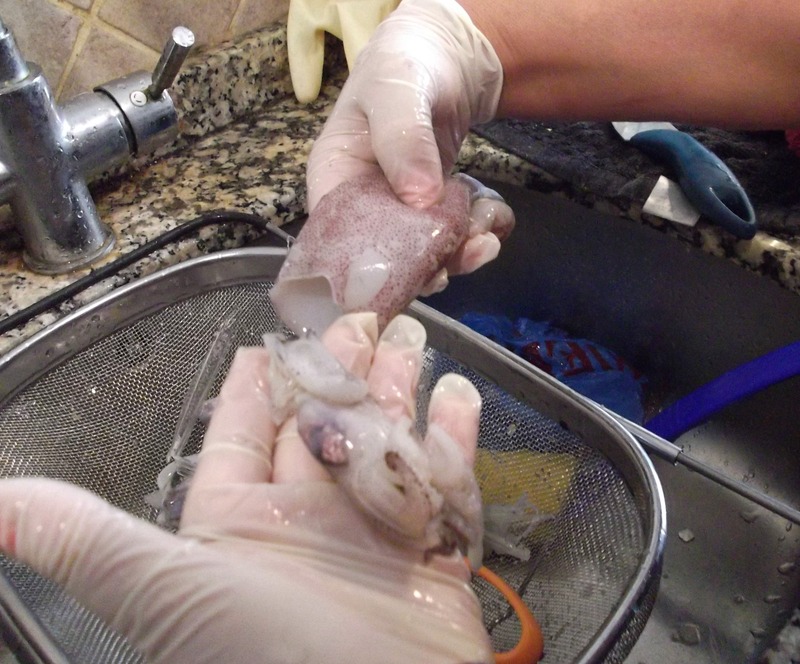 Rinse the legs and contemplate your bowl of lovely clean squid. Well done! Now you can either cut the squid up or leave it whole. 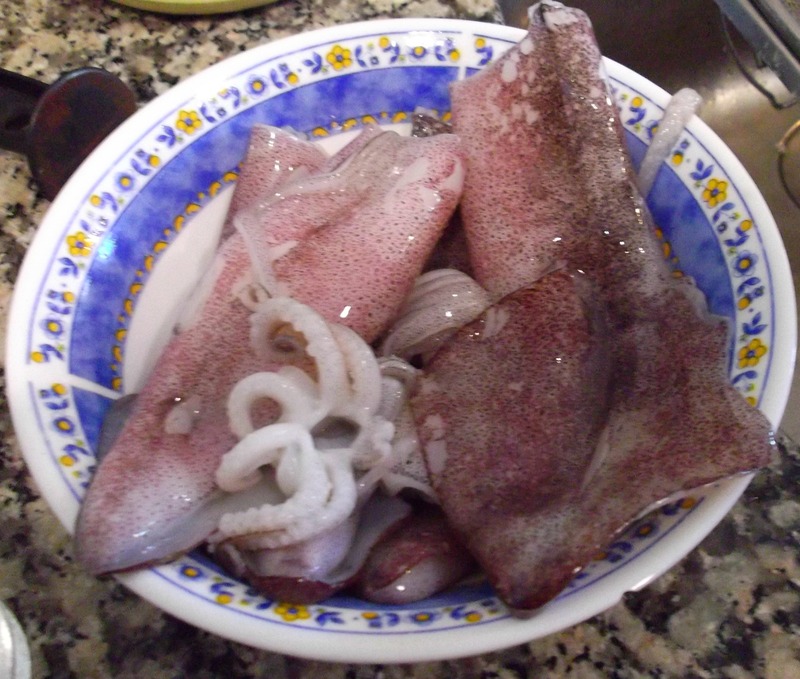 For battered squid rings (covered in flour and deep fried) “A La Romana”, you´ll need to slice. Today we´re just going to keep it very simple. 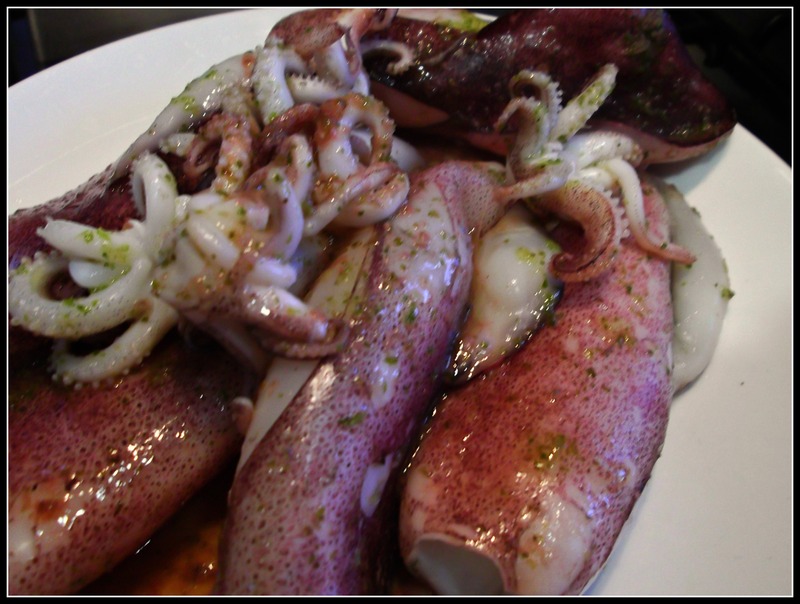 Sprinkle with salt and olive oil and put onto a hot griddle or into a frying pan (no oil needed as you have already put some on the squid). Keep the heat high, they´ll need a couple of minutes on each side depending on their size. When the flesh is no longer opaque but a good white colour, turn and continue to cook. Remove from the heat when done and either drizzle with salsa verde and lemon juice, or add some finely chopped parsley, garlic and lemon juice. Serve with plenty of delicious crusty bread to mop up those amazing juices. 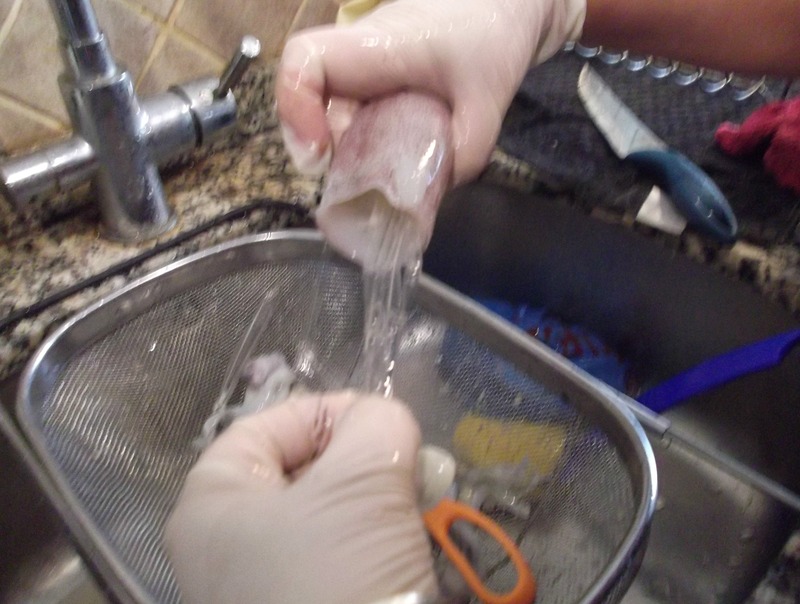 And if you can´t get hold of fresh squid, oriental stores often sell packets of squid tubes frozen which are very good!